One of the things that makes Avery and Juliette work so well is they're the two characters who have grown more than any others. Their arcs have been from spoiled and nasty brats to mature and kind-hearted adults. They understand each other completely. Glenn also understands Juliette, but he missed a couple cues that she was riding on Howie V out of anxiety that others might not touch her. Juliette's decision to go with her gut and choose to produce Avery's version of "Don't Put Dirt on My Grave Just Yet" felt like a final growth spurt for her. She's on the right path and knows how to get there -- by being true to herself. It's also so funny to remember the animosity between her and Rayna and to look at them now, concerned and there for each other when things get tough. Waiting for Rayna to break was difficult to watch. It wasn't possible that she would just carry on with her life after losing Lamar. 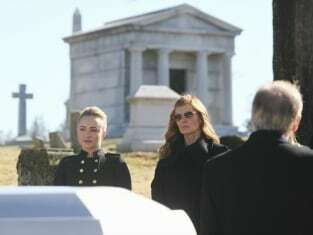 Finding herself surrounded by things that reminded her of him at a different time and likely reliving her last conversation with him finally pushed her to the edge and Connie Britton nailed the grief Rayna was feeling. It was a mourning so sudden and all encompassing and the cries were so genuine I instantly began to sob with her. That kind of acting amazes me, but it didn't shock me coming from the amazing Connie Britton. What did you think about the episode? Are you sorry to see Lamar go? Do you wish Teddy would take a hike and Scarlett ride off with him? Chat about it in the comments. In the meantime, you can revisit Britton's brilliant acting when you watch Nashville online! Which version of Juliette's song did you like better?